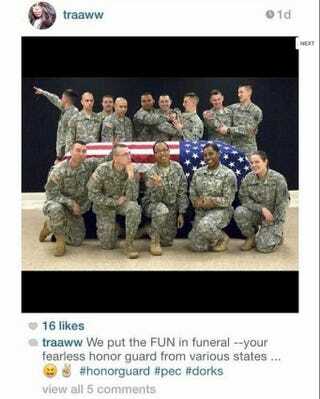 A National Guard soldier has been suspended over a photograph depicting her and a group of other soldiers posing with what appears to be a casket for a military funeral, along with the caption "we put the FUN back in funeral." According to Stars and Stripes, the casket seen in the photo is not part of an actual funeral for a servicemember and there was no body inside. It is a training casket at the Professional Education Center, a National Guard training facility in North Little Rock, Ark., according to the Wisconsin National Guard. Nevertheless,the image has gone viral and generated a lot of anger among military members and supporters. The photo was discovered on the Instagram page of Spc. Terry Harrison, a member of the Madison, Wisconsin-based 1st Battalion, 147th Aviation Regiment. One of the photos shows a group of soldiers in Army Combat Uniforms, some posing disrespectfully around a flag-draped training casket, along with the aforementioned caption. The other photo shows Harrison in a car, and the comment below it reads, "It's so damn cold out. Why have a funeral outside!? Somebody's getting a jacked up flag," suggesting that the family of a fallen servicemember would receive an unprofessionally presented American flag during the ceremony because of the poor weather. Harrison has been suspended from the funeral detail indefinitely. As of now, Stars and Stripes reports none of the other soldiers in the photo have been identified. The other soldiers in the photo belong to other units, according to Maj. Paul Rickert, the Wisconsin National Guard's director of public affairs. Rickert said he does not know the identity of the other soldiers. The Wisconsin National Guard described the photos and comments as "distasteful," and said the organization first became aware of them late Monday. On Tuesday, people flooded the Wisconsin National Guard Facebook page, expressing shock and disgust. Harrison quickly closed her Instagram account when the images went viral. Rickert said the National Guard allows soldiers to post on social media but stipulates members must "perform professionally and not dishonor the military," according to USA Today. "She has received death threats to her and her family," Rickert said. That's sadly not surprising, when you consider how high emotions run when it comes to general public's zealousness not only for protecting the military, but for honoring fallen servicemembers. "A military funeral is the final show of respect for our veterans and their families, and we take that solemn duty very seriously," Rickert said. "The very name 'military funeral honors' underscores the importance we ascribe — both as the military and society at large — to such solemn occasions. These photos and comments do not appear to align with those values." This story on the heels of another story involving a military member caught in a social media firestorm, after a three-year-old picture surfaced online. The picture depicts an airman "kissing" the iconic POW-MIA logo and has also resulted in a firestorm of outrage.